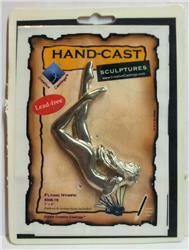 These sculpted lead-free castings come with patterns and suggestions for adding glass to create beautiful three-dimensional figurines. (Can a fish be considered a figurine? Or do figurines only refer to humans?) 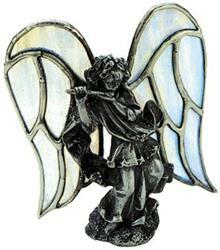 Made of a lead-free alloy, the castings accept black patina. After application, a light brushing with fine steel wool effects the look of pewter. The castings may also be painted. 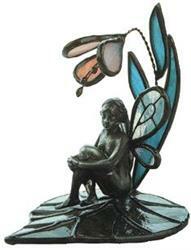 Add fins, wings, flowers, etc., of your own design to these castings to make your own unique three-dimensional scene. Patterns are included for the suggested usages shown, but the castings can be used in many other designs. Your own ingenuity will undoubtedly be spurred to greater and more attractive designs. Images shown are finished items. Product includes casting only. You have made a lovely small window panel, or perhaps a jewelry box; yet you find it to be lifeless, missing a certain je ne sais quoi. Well we have just the qois: un chat! 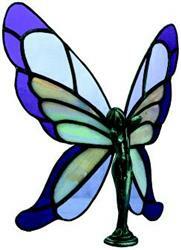 This lead-free casting is a bit over 3 inches from tip of the ear to tip of the tail, and can be easily soldered to your next stained glass creation. 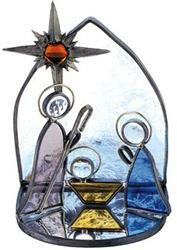 It comes with a suncatcher pattern of a small window: the cat perches on the windowsill, gazing outdoors. 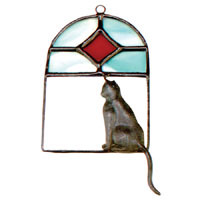 If you were to hang this particular suncatcher, note that the weight of the cat will cause the suncatcher to tilt slightly. You might want to reposition the hanging loop (or the cat). 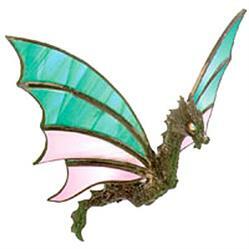 Our bejeweled flying dragon is named Benjamin. He does not like to be called Ben, although his younger brother Dilbert (#6514) insists on doing so. He has resided in the laurel forests of the Canary Islands since 1984, when he left the Black Forest of southwestern Germany and never looked back. On his way south he took a detour to Austria where he picked up two magnificent Swarovski jewels, which he placed in his eyes to give himself a beautifully menacing visage. 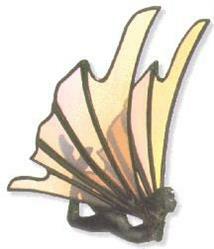 Patterns and instructions are included for you to create and attach appropriately fantastic wings to Benjamin. This sculpted lead-free figure is supplied with patterns and instructions to help you create a finished three-dimensional figure. 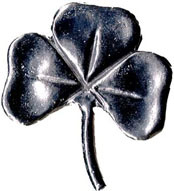 Metal alloy casting accepts black patina. After application, a light brushing with fine steel wool effects the look of pewter. 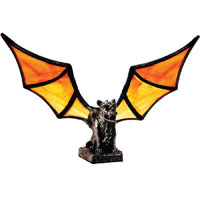 Dilbert, our flying dragon, is very sweet once you get to know him. He spends his summers in Schwarzwald, the Black Forest of Southwestern Germany. When winter comes, he packs up his toiletries (just a toothbrush and nail clippers, really) and heads south to the Laurel Forests of the Canary Islands, to visit his older, more flamboyant brother Benjamin (#6524), who visited the Canary Islands once in 1984 and never left. This army of frogs needs only a lily pad of your own design and it will be ready to take on a scourge of mosquitos, a business of flies or even a rabble of gnats. Click the image to see a larger version. Includes casting only. Patterns are included for the suggested use shown, but the castings can be used in many other designs. Without fins, this little fellow looks like someone's dinner. But add some colorful fins and you'll have yourself a beautiful fish. Click the image to see a larger version. Includes casting only. Patterns are included for the suggested use shown, but the castings can be used in many other designs. She seems to be waking up from a peaceful slumber, hands behind her head, which is tilted slightly to one side. Her hair is draped somewhat strategically down the front of her impossibly svelte body. Please note, this is not a finished sculpture, it is only the casting of the lady's body. Some some patterns are included for the suggested use shown, but the casting can be used in many other designs. Includes casting only. Patterns are included for the suggested usages shown, but the castings can be used in many other designs. These sculpted lead-free figures are supplied with patterns and instructions to help you create a finish three-dimensional figures. 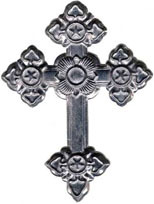 Metal alloy casting accepts black patina. After application, a light brushing with fine steel wool effects the look of pewter.